Were announced late last year at the MWC 2013, YotaPhone quite caught everyone's attention, because this smartphone uses two screens, two screens are the LCD panel on the front and a 4.3 inch 720p display e-ink on the back, the e-ink on the back will always be active because the battery does not consume energy at all. Currently, an information saying that the Android smartphone will start shipping from Russia international before Christmas. YotaPhone has teamed up with Singapore's Hi-P manufacturers for mass production smartphone. 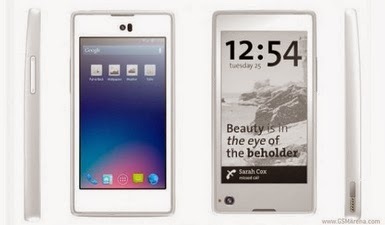 Yotaphone official price of the device is not yet known. In addition to using two screens, YotaPhone powered by a dual-core 1.5GHz CPU, 2GB of RAM, 32 GB of storage space or 64 GB and 2,100 mAh battery.